Tiny Knick-Knacks & Message Bottles, This Store In Adyar Has Them All! 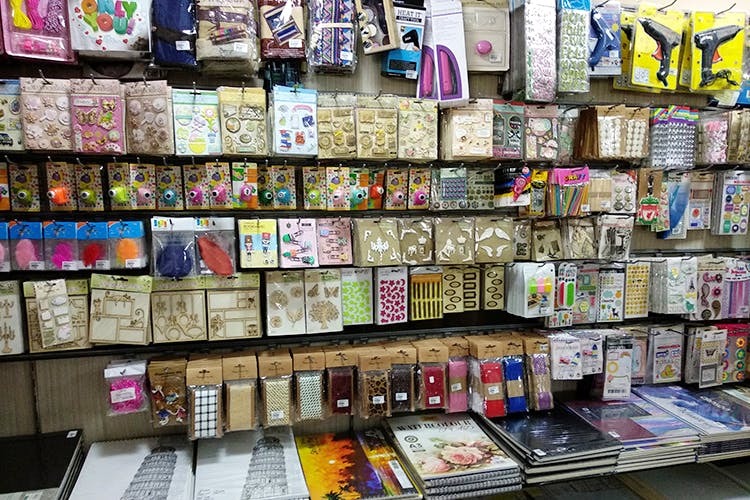 Anandha Stationery Store in Adyar is a dreamy art store that you cannot miss, courtesy their paints, knick-knacks, party decor items, stamps, and more. Anandha Stationery Store is a one-stop shop for everyone - students, artists, hobbyists, and children. Acrylic, watercolour and oil paints, neon pens, craft paper, sketch pens, sparklers, art books, you name it and they have it all. But what caught our attention at this four-year-old store is the stamps, stickers, and ribbons. Praveen Jain, the owner of the store tells us that the stamps and stickers are a big hit among college students who use them for their scrapbooks. Yes, they still exist and we are equally shocked! The plastic flowers, polka-dot ribbons are decorative items that can be used as per your creativity and start from INR 55. Add some colour to your office cubicle with the wooden clip set (INR 60) that have drawings on them. For those taking the creative plunge, check out their DIY book kit (INR 225) that helps you make your own drawings. The wooden stamp set that comes in different prints like feathers, flowers, and hearts (INR 495) make for a great gift. Looking for a personalised gift? Grab one of their message bottles that come for INR 15 and write a little note that will last for a lifetime. Their first shop was established in 1982 in the same area. They also undertake bulk orders for corporates.